LIVERPOOL — Another couple in the UK is fighting for their son’s life after a judge ruled on Wednesday in favor of the hospital’s wishes to remove live support. 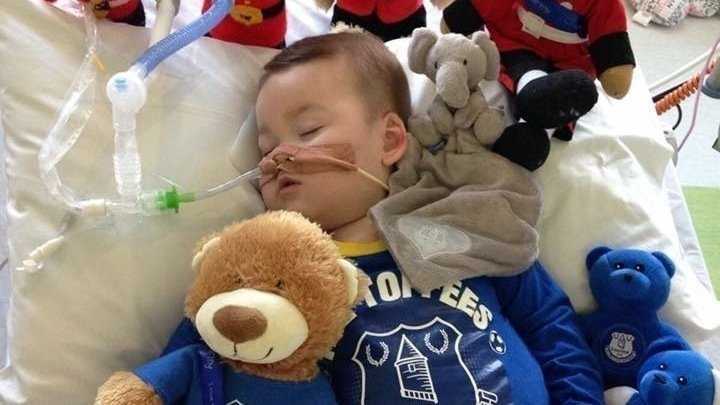 Tom Evans and Kate James took their then six-month-old son Alfie to Alder Hey Children’s Hospital in Liverpool in December 2016 due to a chest infection. The child, who had been born healthy by all indications, had been taken to the doctor by his parents prior to his admittance as he began exhibiting abnormal jerking movements. Evans and James state that they were told that the boy was simply a late bloomer. While hospitalized, Alfie struggled to breathe due to a myoclonic jerking spasm, and was placed on life support. In January 2016, it was thought that Alfie would not make it, but he overcame the infection for a time and began to improve. However, the infant had to be intubated again after contracting another infection, and is now stated to be in a semi-vegetative state. Evans and James state that they still do not know specifically what is wrong with their son other than that he has a degenerative neurological condition, and disagree with the hospital that Alfie is unaware of his surroundings. “Time and time again, despite not being diagnosed or treated for any suspected underlying disease, his seizures being somewhat controlled by a heavy cocktail of sedating drugs, Alfie has come back over and over from every infection and challenge,” a petition on Change.org reads. The petition has over 229,000 signatures as of press time. “The hospital claims that Alfie is ‘insensate’ and unaware of any stimulus or irritation, which is proven wrong in hundreds of videos, against the odds of a heavy cocktail of anti-seizure drugs with sedative effect. Daily, Alfie moves, stretches, yawns, responding to tickling and noise and cuddling,” it states. Alfie’s parents want their son transferred to another hospital where he can be weaned off sedation, undergo a tracheotomy and PEG tube placement, and obtain a definitive diagnosis for his disease—or at least a second opinion. They would like to send Alfie either to Italy or Germany to obtain help. However, in court proceedings, hospital officials testified that they believe that Alfie’s brain is “entirely beyond recovery” and 70 percent damaged. They argued that it is in the child’s “best interests” to be withdrawn from life support. According to the BBC, Justice Anthony Hayden ruled in February that Alfie’s plight was “profoundly unfair,” but agreed with Alder Hey that treatment measures would be futile, and that the nearly two-year-old boy rather needs “good quality palliative care.” A court of appeals upheld the ruling last month. “This afternoon, I have endorsed the care plan constructed by the Trust setting out the provisions for the end of Alfie’s life. That plan has the endorsement of Alfie’s guardian, who emphasizes in effect it is long overdue,” he wrote. Evans and James have filed one more emergency appeal with the help of the Christian Legal Centre, which expressed disappointment in Hayden’s conclusion. They believe that their parental rights are wrongly being usurped. “My thoughts and prayers are with Kate and Tom this evening,” he said. Evans told reporters following the ruling that since there are hospitals that are willing to take his son, he should be given that chance. He also believes that video footage (below) of Alfie stretching, yawning and opening his eyes, shows that doctors shouldn’t give up on him yet. The Christian Legal Centre says that Hayden viewed the recordings, and while he remarked that he was “not medically capable of determining what he was actually seeing in the video,” he proceeded with the end-of-life ruling anyway in light of the grim testimony presented by hospital representatives.